The CableFree range of LTE CPE devices includes Indoor and Outdoor devices to allow operators to construct LTE networks to meet a wide range of user and application requirements. Outdoor CPEs are ideal to connect fixed locations, residential and business customers with “xDSL” replacement for rural broadband and also resilience for existing copper and fibre leased lines, or to connect CCTV cameras back to monitoring locations. 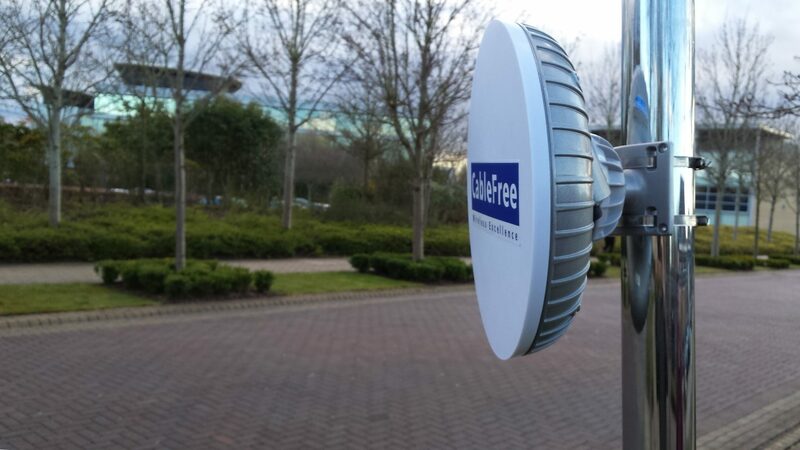 CableFree offer a unique range of Medium and High Gain LTE CPEs for moderate to long range capability, a wide range of frequency bands support and versions for Cat 4, Cat 6, Cat 7, Cat 11, Cat 12. CableFree LTE CPE devices are ideal for use with either existing 4G Operator networks, or with CableFree LTE Base Stations to create private closed networks. In either case, the idea is to simply insert a SIM card, point the CPE at nearest base station tower, and get online. The CPEs include Layer 3 routing features and advanced management features to ensure that large networks can be easily managed and provisioned.4G/LTE Outdoor CPE devices offer similar features to the Indoor CPEs but are weather-proof All-Outdoor Units with high gain directional antennas, integrated IP bridge/router and Power-over-Ethernet technology, to provide long range coverage and connectivity to the LTE base stations. Cat4, Cat6, Cat7, Cat12 devices available. Higher gain antenna versions are available: With up to 20dBi 2×2 MIMO in 3.5GHz band, integrated high gain antenna ensures the longest possible connection distances to the LTE tower to maximise addressable customer base for the operator. In addition, the higher gain enables high speed connections to be achieved, suitable for business and high end residential services. Covering popular LTE bands including Band 42, 43, 48 and others, the Outdoor High Gain CPEs are easy to install on pole, roof or wall locations, and are pointed at the nearest or most suitable LTE Base Station to ensure good signal levels. Cat4, Cat6, Cat7, Cat12 devices available. CableFree weatherproof LTE CPE devices are ideal for residential and small business customer applications for home and small offices. Also ideal for CCTV networks to connect cameras back to core networks, using private 4G LTE networks or public LTE networks. These Outdoor CPE devices do require professional installation on wall or rooftop locations and can be quickly installed in hours, plugged in, with appropriate SIM card inserted, to create a fast broadband connection to the user premises. Simple LEDs enable ease the installer of optimising the alignment.